Summary: Luis is sad because his brother Nico is leaving to join the army and go overseas. When Nico tells Luis he is going to see the world, Luis begins painting a mural trying to capture the world so Nico will want to come home again. After Nico leaves, Luis incorporates photos that Nico texts him into his mural. Gradually, their mother and others from the neighborhood join in to make the mural a community effort. The seasons pass, and finally, one warm summer day, Nico comes home again. A note from the author explains that Luis, Nico, and the mural are based on her experiences working in Lawrence, Massachusetts. 32 pages; ages 4-9. 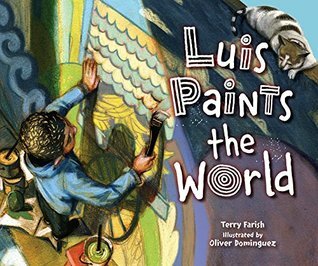 Pros: The rich, colorful illustrations capture Luis’s mural beautifully, and the story is real and heartfelt. Cons: A few of the Spanish words and phrases aren’t translated.